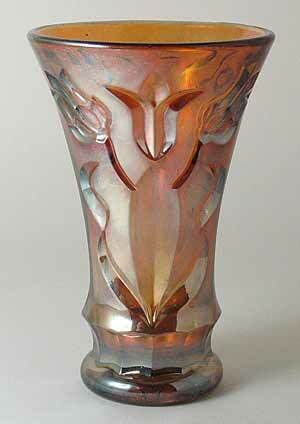 Tentatively attributed to a Finnish maker, this 6-inch tall vase has an inscribed pattern of tulips. While some people have called the glass color a light pink or lavender, a close examination shows no color to the glass at all. The exterior iridescence gives it an amber appearance that does not have the multi-color effect. The interior does have multi-color iridescence. This example sold in 2005 for $130.